LA Phil’s Music and Artistic director, Gustavo Dudamel believes, “music is a fundamental human right.” So for the first time Hack Music LA partnered with LA Phil Harmonic to create a hack-a-thon that brings technology and music together to find new and innovative ways to make music accessible. Students could apply as individuals or teams of three and were encouraged to work with partners in different disciplines, from musicians to animators to filmmakers. 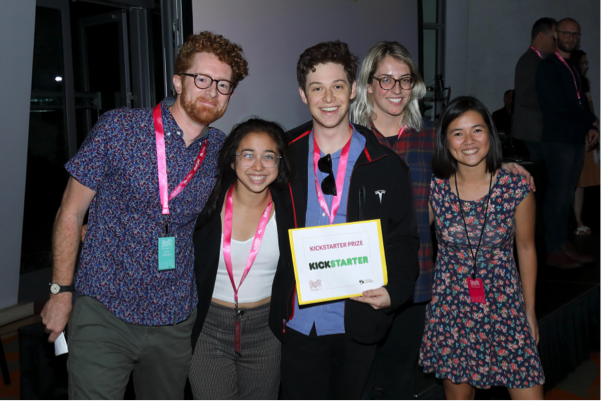 SCA’s own Carolyn DiLoreto (Media Arts and Practice ‘18), Emily Halaka (Animation ’18), and Grant Singer (Production ’17) were winners of $1,000 and a mentorship with Kickstarter at the October event. In just two days the team had to come up with an idea and prototype it. Their final product was Amüse, “an augmented reality application for mobile phones that allows users to use music in everyday shapes and objects, objectively making everyone a musician” DiLoreto explained. Lines on walls and buildings could turn into music and colors could even turn into harmonies. The app is geared towards school-aged children who are beginning to learn more about music.